!! OMG, do you like green eggs and HAM? : Scientists create glow-in-the-dark pigs using jellyfish DNA !! If you’re planning your next midnight truffle hunt, or an all-day breakfast buffet rave, then you’re in luck this week as scientists were able to isolate a fluorescent protein in jellyfish DNA and inject it into pig embryos! FINALLY! Here I was, waiting for them to cure cancer, and instead we have glow-in-the-dark piglets. The piglets are expected to live full lives (unless they get turned into glow-in the dark bacon, which could also be pretty rad — sorry, but you have to admit). Be the first to comment on "OMG, do you like green eggs and HAM? 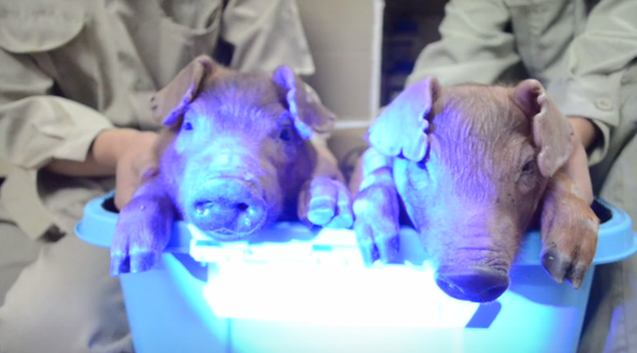 : Scientists create glow-in-the-dark pigs using jellyfish DNA"